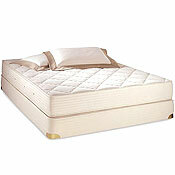 Royal-Pedic Natural Latex Quilt-Top Mattress, Boxspring, and Mattress Pads. All natural latex core, organic cotton covering, natural wool layer for comfort and proper body support. Bed Set includes Royal-Pedic organic cotton and wool Box Spring. Frame and organic mattress pads sold separately. box spring is covered in the organic cotton fabric, and padded with layering of organic cotton and a layering of chemical-free, French Wool. 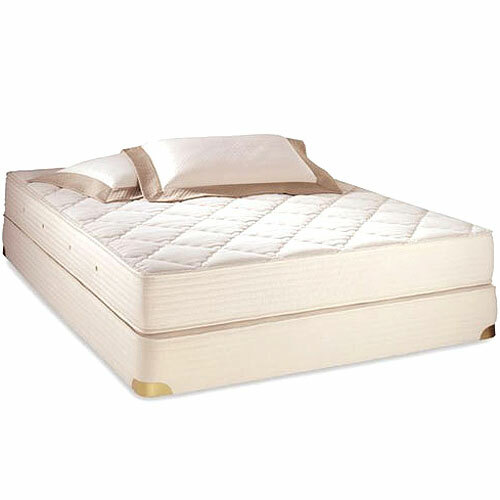 The 7-Zone all natural Latex Quilt-Top Mattresses are carefully constructed to offer you the best quality and ergonomic support for optimal sleeping comfort. The mattress is cover in 100% organic cotton and is quilted with a layering of chemical-free French wool that acts as a natural fire barrier. 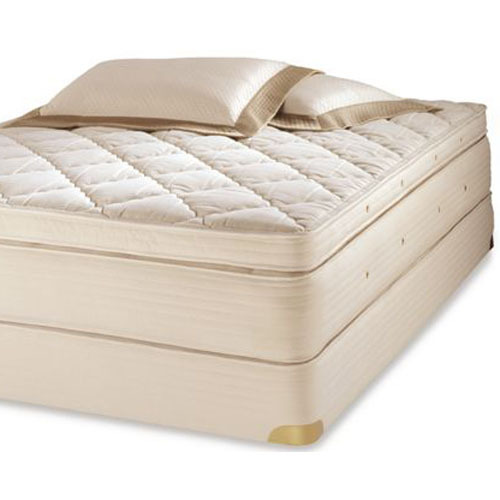 The Royal-Pedic Natural Latex Quilt-Top Mattress is our softest available, yet still provides proper support due to the 7-zone core featuring a firmer lumbar zone to prevent the spine from sagging. The Natural Organic Latex Quilt-top Mattress Bed Set includes the Royal-Pedic Organic H-2 Box Spring with organic cotton padding and a wool wrap. This mattress is our best recommendation for a platform bed because it still contours well to the body on a hard surface. It also is the most popular choice to use with an adjustable bed because the latex flexes with the bending of the bed like no other. Seven Firmness Zones: are ergonomically designed for correct support and uncompromising comfort. Softer upper back and pelvic areas offer pressure point relief and spinal alignment. Firmer lumbar area supports spine to relieve tension and lower back pain. Pressure Relaxation Channels™: provides flexibility, pressure point relief and spinal alignment when side sleeping. 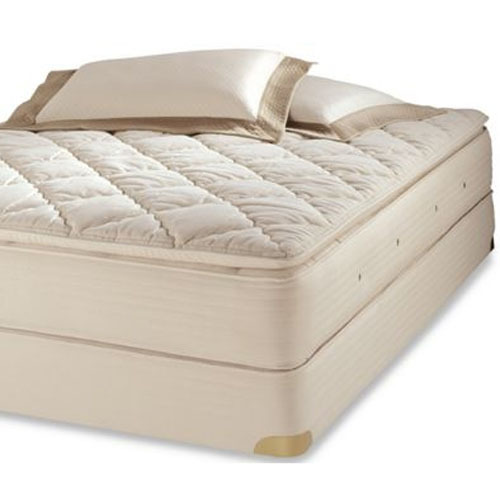 Natural Latex Core: is naturally hypoallergenic, hygienic, anti-bacterial and dust mite resistant. It is harvested from Rubber Trees and processed using the Talalay process for a more natural 'spring' feel. Talalay Latex actively responds to the body's contours for better comfort and support than Dunlop processed natural latex. 100% Organic cotton ticking: woven in the U.S. and Peru ventilates body heat and is free of chemical treatments. Retains Firmness Levels: delivering reliable support and softness. Mattress conforms to body contour immediately, regardless of room temperature (unlike temperature sensitive foam mattresses). Independent Support: regardless of weight, each person receives the proper support and mattress maintains a level sleeping surface, so you are less likely feel as if you are being rolled into the middle. Symmetrically Designed: support zones are consistent when mattress is rotated head to foot or top to bottom. Designed for all Heights: the length of a person's torso, regardless of their height, is very similar; height is generally determined by the length of the legs. H-2 Organic Box Spring: provides firm, yet flexible support for comfort and longevity. The box spring is covered in the organic cotton fabric, and padded with layering of organic cotton and a layering of chemical-free, French Wool. Optional Organic Mattress Pads: for a pillowtop feel, add the 2' or 4' Royal-Pedic Organic Pillowtop mattress pad for added cushioning, luxurious comfort, and additional pressure point relief to hips and shoulders for the ultimate in rest and relaxation. Sold separately below. *Box Spring is 7 ¾ ' deep, Metal Frame is 7 ¼' high. Total height with mattress box spring and frame = 23'. Option: Removal and disposal of old mattress/box spring is available for $100 per bed set. Please place a removal order using the last orderbutton on this page for the service.